Win a Notorious B.I.G. Funko Pop! The 22nd anniversary of the murder of the Notorious B.I.G. passed earlier this month on March 9. Tributes to the late, great rapper range from a mural and basketball court in his native Brooklyn, to toys bearing his image. 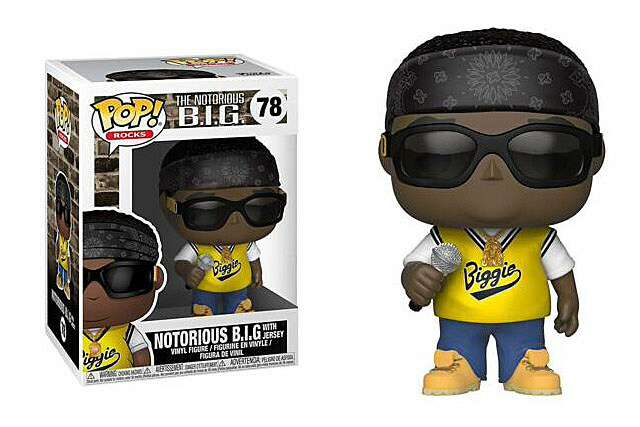 Funko have made not only one but several Biggie Smalls Pop! figures, including one where he’s wearing a crown, another where he’s wearing a Biggie jersey and bandana, and a third, no longer available edition of Biggie in a suit, which was also made in a metallic version that was a San Diego Comic Con 2011 exclusive. Entertainment Earth has two editions of the Biggie Pops! for sale, and we’re giving one away, too! Enter to win the jersey-wearing Notorious B.I.G. Pop! by filling out the form below. Congratulations to Amanda Garza, who won our last toy giveaway, of a limited edition, deluxe box set of KISS action figures. Stay tuned for more contests, too.